Once upon a time, Donald Glover said that he wanted to play Spider-Man in the movies. 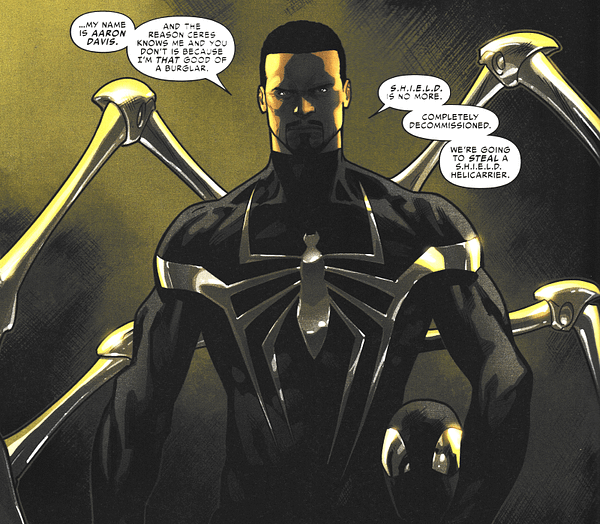 It was part of a chain of events that saw Brian Bendis create Miles Morales with Michael Bagley for the Ultimate Spider-Man comic books, with the character taking over in the role from the Ultimate Peter Parker when he died. In the Spider-Man Homecoming movie, Donald Glover was cast as a petty criminal trying to gain alien technology, with the Easter egg that Miles Morales is his nephew, making Glover’s character Aaron Davis, Miles’ criminal uncle, in the Ultimate Universe, The Prowler. It’s a good, but small role. But if they keep up with the Bendis comic books in the Sony/Marvel Studios Spider-Man movies, as they have already, it’s good news for Donald Glover. As we have Brian Bendis continuing, as in Invincible Iron Man to follow up on the plotlines of Secret Empire, such as the closure of SHIELD, even if he didn;t want to crossover any of his titles with the actual event… as more criminals get put on the streets. 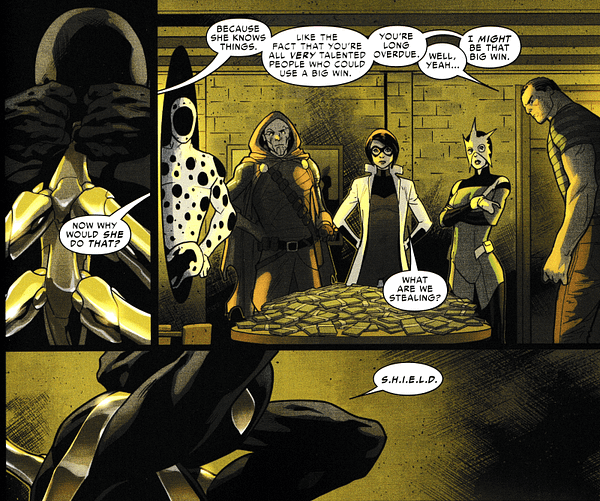 Which makes for an easier job for a new Sinister Six to be recruited and put together, and all sorts of criminal possibilities in the wake of a ex-SHIELD…. And he’s about to be Miles Morales’ new nemesis. Maybe something that is being reinterpreted and reworked for Spider-Man Homecoming 2? With a sign from Marvel Comics that the character can be in the comics as well as in any potential movie? 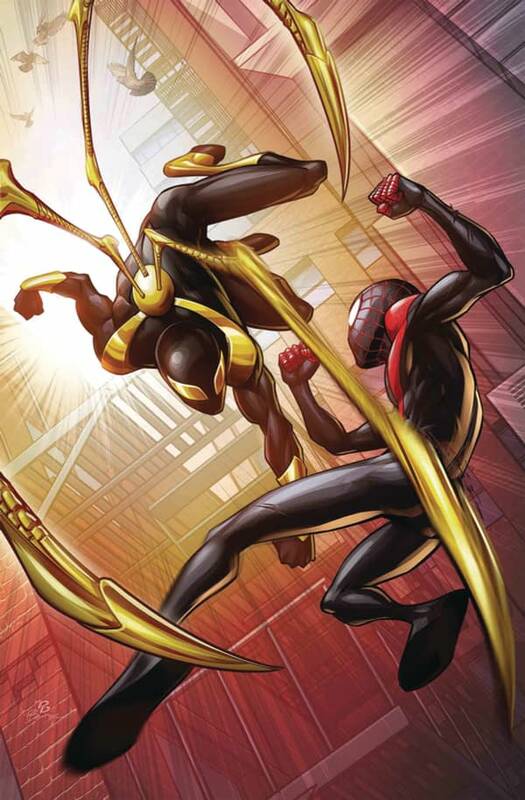 • The mysterious new Iron Spider rolls into Miles Morales’ life with the destructive power of the new Sinister Six. • Sadly for those close to Miles, it’s not just his life that’s going to get obliterated. • The Bombshells are back together?! • Lana has been through so much and has grown into a hero, but with her mom back in the equation, things look bad for her. • Know who they look even worse for? MILES MORALES, SPIDER-MAN! And with Electro in the mix as well…?